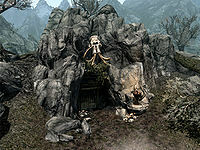 Bruca's Leap Redoubt is a small cave inhabited by Forsworn. This location's map marker is named Bruca's Leap Redoubt. The entrance door is SE of the marker. The following can be found near the entrance: 2 Namira's Rot fungus, 1 Chickens' Nest and a Chicken. The cave has only one zone which is very small. It is simply a bending passage leading down to a chamber. The chamber has some wooden scaffolding. 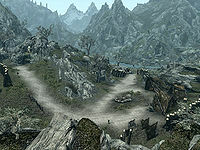 The Forsworn Briarheart and its guard will likely be alerted to your presence right away. However, by sneaking it is possible for you to snipe at them from the window-like opening straight down from the entrance. On the ledge you will also find an iron dagger. At the bottom of the tunnel, you'll find a coin purse and a Dwarven arrow. 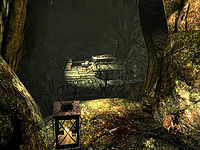 Lying on a table is the corpse of a Forsworn who was in the process of being transformed into a Briarheart: his heart and an iron dagger are placed nearby. Various pelts are lying around while on a bookshelf you'll find a copy of the Enchanting skill book A Tragedy in Black along with a few ingredients. At the bottom is an apothecary's satchel, and a random potion is placed in a bucket nearby. The boss chest is behind the bookshelf, but make sure you avoid the bear trap in front of it. The following plants will always be found: 1 Blisterwort, 1 White Cap and 3 Namira's Rot fungi. Bruca's Leap Redoubt isn't marked as a cave, so cave-based radiant quests won't target it. There is also a goat hide that you cannot interact with. This page was last modified on 11 November 2017, at 01:43.